Find out why Prawns are amazing for your body and mind. New tech makes prawn fishing and farming one of the most planet friendly food sources. Queensland is a spectacular state of endless beaches, reefs, fertile land and friendly people. But it’s not just an irrational fear of daylight savings that sets Queenslanders apart from others. Being a Queenslander means measuring rainfall in metres, wearing zinc cream to every outdoor event except funerals and having a rush of maroon blood to the head when a cane toad is close to a try. Yes, we have plenty to celebrate in Queensland, but one magical element makes this state truly unique. Tigers, Bananas, Endeavours, Kings - the four pillars of Christmas Day lunch and the reason we Queenslanders are so healthy. Prawns are packed with all that is good for you. Omega 3 oils, quality protein with less fat and kilojoules than nearly any other source from land or sea. So apart from duty to our state, why should we Queenslanders put local prawns on the menu more often? Well, it’s a fascinating story, and one we’re about to share with you in great detail. What a year it's been - floods, cyclones, even an earthquake. But Queensland has rallied and we're well on the way to recovery. Something great has also come from all this water - a sensational harvest of Queensland Prawns. So what better time to enjoy some great Queensland Produce than in Queensland Week - June 4th -13th. Yep, a week that is nine days long. We expect that is because everything is bigger and better in Queensland. 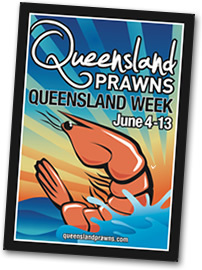 Join in, RSVP to our Facebook event; Listen to Queensland Prawns Radio and check-out the special events with great prawn specials by participating retailers. At Seafood Directions, the bi-annual national seafood conference, the prawn farmers and wild catch sector united to produce Australia's biggest prawn cocktail. They make them big in Queensland. And they don't get much bigger than this - 120 iceberg lettuces, 60 kilograms of prawns and 60 litres of sauce were mixed into one gigantic cocktail glass to become Australia's largest prawn cocktail.